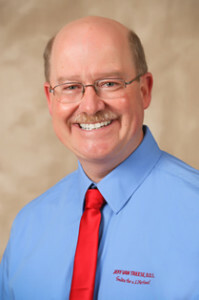 Dr. Van Treese graduated from Miami University, OH in 1982 and went on to Ohio State University where he graduated from the dental school in 1986. He served a general practice residency in 1987 and then came to Sidney to start his dental practice. 2014 marks his 27th year as a dentist in Sidney. He has been married to Libby since 1981 and they have four young adult children. The whole family is active in Tournament Water Skiing and they have won several national awards. They have one dog and three cats. Dr. Van Treese is very active in his church, where he is a Board member and past chairman of the Sidney First Methodist Church Foundation. He currently serves on the Board of Directors for the Sidney-Shelby County YMCA with additional responsibilities to the YMCA Foundation Board. Dr. Van Treese was very active in helping to bringfree dental care to the uninsured and under-insured to the Shelby County area by working with the free medical clinic Compassionate Care. He is just beginning a term on the Compassionate Care Board of Directors. He and some of our team members regularly volunteer their time to this great cause. For the past several years, he has been the local chairman for the Give Kids a Smile program, which is a national event held every February to bring free dental care to children who are uninsured. Many dental offices in our area participate in helping the children of Shelby and Miami County to begin on a journey towards great oral health for a lifetime.